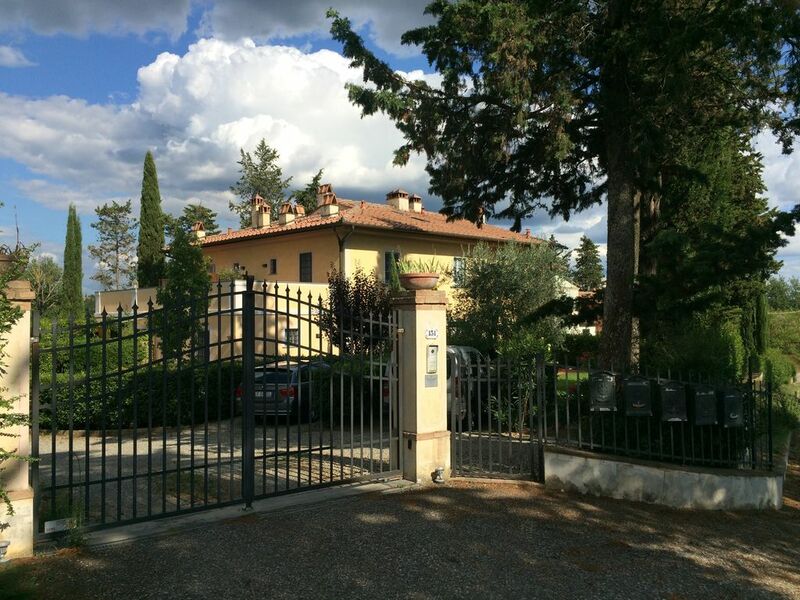 Recently restored in typical Tuscan Country Style Ex Priest Residence accomodates up to 7 guests. Located on top of a hill which offers astonishing views of the surrounding hills. Lovely Cosy Garden with Old Olive Tree and Sundeck with Outdoor Shower. Situated only at 30-40 minutes driving distance from Pisa and Florence Airport, centrally located for the best location in Tuscany. Ground floor large sitting room and fully equipped kitchen with bathroom, upper floors, two bedrooms and bathroom.At the entrace a large sitting room welcomes guests who can enjoy flat screen tv with Sky channels, audio system, an old fireplace, a convertible armchair and sofa. At the ground floors fully equipped kitchen in Marble includes dishwasher. over, juicer, coffee machine, old table up to 10 seats and a small tv. Also a bathroom and laundry room. Upstairs a modern bathroom with large shower and no baththub, one large bedroom with king size bed, flat screen tv and walk-in wardrobe. Also in the third level, the second bedroom with a super king size bed and flat screen tv and audio system. an Ipad is also provided with free wifi everywhere in the house and in the garden. Thia area has features the most beautiful Hills of Chianti and it is centrally located in Tuscant, close to the major touristic attractions. i enjoy a different day trip each weekend when i am off work. i love small ancient villages and the best gastronomic locations and festivals. When i bought my house the company who managed the restoration was giving an Anonymous look to the shares of the property. so thanks to a friend of mine, i could customize materials and design of the interiors. Beside some details in the furniture are still to be completed and changed, i love the fact that the recovered ancient terracotta floor styles, the big wooden beams and the oak tree hardwood floor on the upper level are there. Between my neighborhood my home has the best view over the Hills and it s the sunniest property. I am also proud of my garden that i designed and created with my hands. private inside the property for one car, and public parking outside in front. both moka and nespresso machines are supplied. Fully equipped kitchen with large Stove and large (90 cm) gas oven. a fireplace is also available for special grilled dinners or for relax. dishwasher, large Marble sink. Since this is the property where i live when it s not rented i would require referenced people and people who respect the environment where they live. Smoking permitted only in the garden and if it will be kept clean from cigarettes. Located in Chianti wine area, central in Tuscan. Most of the touristic Tuscany best locations are at less than one hour driving such as San Gimignano, Siena, Monteriggioni, Volterra, Florence, Lucca and Pisa. Public swimming pool is located 9 km away from home. The surroundings are provided with trekking routes and horse back riding, cooking classes, wine and oil tasting experiences and rental bikes is also possible. There is an additional gas charge only for heating during the winter months. it will be calculated at 5 euros per cube meter of consume. there is a meter to read at check in and check out.